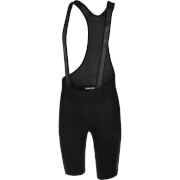 Castelli Velocissimo IV Shorts. Incredible value for money and some great new features make the Castelli Velocissimo IV Shorts better than ever. Technology borrowed from the Premio shorts and a new matte finish makes them classy and comfortable shorts for any type of riding Castelli have redesigned the Velocissimo IV shorts with a new anatomical fit that sits just right and moves stitching away from areas most prone to chafing. The improved design also includes a new waist construction that sits higher to give core support whilst still offering flexibility when in a racing position. From the top of range Premio Bib Shorts comes the innovative leg grippers, where Castelli have been able to eliminate the usual leg band without compromising grip. It also lends the shorts a super-sleek look Castelli make use of their Kiss Air seatpad, featuring many of the advances found in their range topping Progetto X2 seat pad but at a more affordable price. A seamless top layer, that's highly flexible and bacteriostatic avoids saddle sores and infection. Meanwhile the dual density, variable thickness foams work to cushion and support just where you need it most, removing bulk where you don't need it Features: Main 62% Polyamide, 38% ElastaneWaist: 80% Polyester, 55% ElastaneAnatomically constructed for exceptional fit and comfort in Pro Dry 210g fabricNew Doppio waistband for extra stretch around the stomach areaKISS Air seat pad for all-day comfortRaw-cut leg ending with silicone horizontal gripper keeps shortleg in place without pressureFlat-lock stitchingReflective heat-transfer viz strips for visibilityBuy Castelli Clothing from Chain Reaction Cycles, the World's Largest Online Bike Store.